"Superlight, exceptionally packable GORE-TEX with Paclite product technology jacket created for climbers and alpinists needing emergency waterproof/breathable protection in sudden storms. Alpha Series: Climbing and alpine focused systems | SL: Super light. Carefully designed to be as light and packable as possible without sacrificing key elements required by alpinists and climbers, the Alpha SL delivers highly effective waterproof/breathable protection for sudden storms. 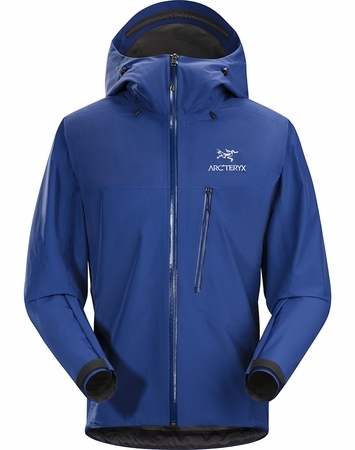 By putting intense focus on design, fabric and feature selection, Arc�teryx designers held the weight at 305g (10.8 oz), and allowed the jacket to easily pack into its own hood or included stuff sack. As weight and space are critical factors in the Alpha SL�s performance, the lightest and most packable GORE-TEX fabric, N40r GORE-TEX fabric with Paclite product technology, is used. Waterproof and highly breathable, the fabric protects from the weather and offers a higher level of comfort during activity. As the Alpha SL is intended for periodic emergency use, a lighter less abrasion resistant face is used to eliminate weight and bulk. However, the fabric has a mini ripstop construction that provides added tear strength without impacting weight. The Alpha SL�s disciplined design is pared down to the essentials. The helmet compatible StormHood delivers full coverage with a secure fit that provides ergonomic performance and exceptional freedom of vision and Hemlock inserts help prevent the jacket from riding up under a harness. The Trim fit with motion friendly e3D patterning is designed for mobility, yet keeps the jacket close to the body to enhance breathability, reduce bulk and improve the line of sight towards a harness. "